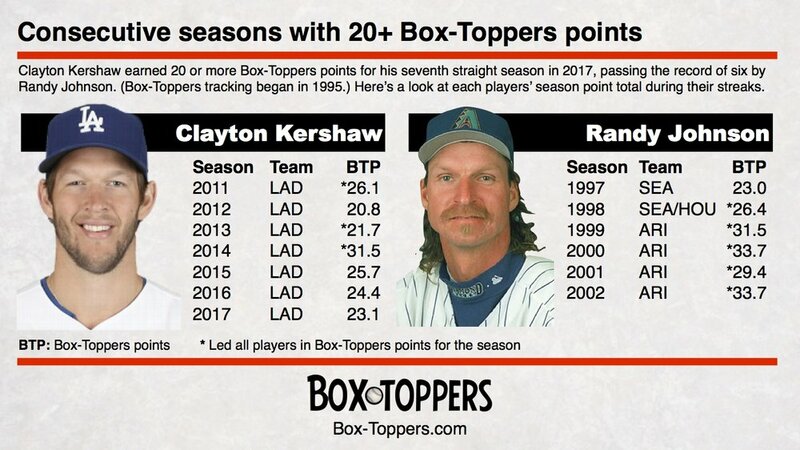 In 2017, Dodgers pitcher Clayton Kershaw broke the record for most consecutive seasons with 20 or more Box-Toppers points. * Current streak as of 2017. Kershaw began his streak in 2011, when he led all players that season with 26.1 Box-Toppers points. During his streak, he has finished first in season rankings three times (2011, 2013 with 21.7 and 2014 with 31.5), he’s finished second three times (2012 with 20.8, 2015 with 25.7 and 2016 with 24.4) and finished third once (23.1 in 2017). Johnson was more dominant during his six-year streak, finishing first five times in a row from 1998 to 2002 and finishing fourth in 1997 with 23.0. Only three players have finished first to win Box-Toppers Player of the Year honors in consecutive seasons and Johnson’s five-season streak is the longest. Johan Santana won three years in a row with the Twins from 2004 to 2006. Kershaw’s two-season streak atop rankings in 2013 and 2014 ranks third. During Johnson’s six-year streak with 20 or more points, he had 30 or more points three times, including earning 33.7 points twice, in 2000 and 2002, the highest single-season point total recorded in Box-Toppers tracking history. Only six times since 1995 has a player earned 30 or more points in a season—Johnson has done it three times, Red Sox pitcher Pedro Martinez did it twice (31.4 in 1999 and 33.5 in 2000, both times finishing second to Johnson) and Kershaw did it once (2014 with 31.5). Though Kershaw’s streak with 20 or more points is longer than Johnson’s, Johnson still has more combined points in his six-year streak than Kershaw has in his seven-year streak. Johnson earned 177.7 from 1997 to 2002, while Kershaw has 173.3 from 2011 to 2017. Johnson is the “all-time” leader in career Box-Toppers points with 278.8. Kershaw ranks third with 206.8. However, since Box-Toppers didn’t track Johnson’s career from 1988 to 1994, he would likely have many more career Box-Toppers points. A rough projection puts his actual career Box-Toppers point total at about 380. Ten players—all pitchers—have earned 20 or more Box-Toppers points in consecutive seasons. One player has two separate streaks—Pedro Martinez ranks tied for third with four straight seasons earning 20 or more points (from 1997 to 2000 with the Expos and Red Sox). Martinez also had a two-season streak (in 2002 and 2003 with the Red Sox), which is tied for the sixth-longest streak. Max Scherzer ranks tied for third with a four-season streak (from 2014 to 2017 with the Tigers and Nationals). Santana rank fifth with a three-season streak (from 2004 to 2006). Six other players earned 20 points in back-to-back seasons—Roger Clemens (1997 and 1998 with the Blue Jays), Curt Schilling (2001 and 2002 with the Diamondbacks), Martinez (2002-2003), Roy Halladay (2010-2011 with the Phillies), Justin Verlander (2011-2012 with the Tigers) and Corey Kluber (2016-2017 with the Indians). There are three players with active streaks of consecutive seasons with 20 or more points. The only other time in Box-Toppers tracking history there have been three active streaks like this was 1998. Kershaw, Scherzer and Kluber all have active streaks with 20 or more points as of 2017. In 1998, Johnson, Martinez and Clemens each had active streaks, as all three earned 20 or more points for their second year in row. Johnson and Kershaw are tied for the lead in most seasons earning 20 or more Box-Toppers points with seven. Kershaw has earned his seven in consecutive seasons. Johnson had 23.7 points in 1995, Box-Toppers’ inaugural season and also had 20 or more points for six straight years from 1997 to 2002. Pedro Martinez ranks third with six seasons. Curt Schilling and Max Scherzer are tied for fourth with four seasons. Johan Santana, Zack Greinke and Corey Kluber are tied for sixth with three seasons. Greinke has the most seasons with 20 or more points without having earned any of them in consecutive seasons. Five players rank ninth, earning 20 points twice—Roger Clemens, Jon Lester, Felix Hernandez, Justin Verlander and Stephen Strasburg. In 2017, eight players had 20 or more Box-Toppers points, the most in Box-Toppers' 23-season tracking history. Here are the seasons in which the most players earned 20 or more Box-Toppers points. 2014 ranks third with six players. 2015 ranks second with seven. 2016 ranks tied for fourth with five. 2017 ranks first with eight. Since Box-Toppers tracking began in 1995, 3,926 different players have earned Player of the Game honors (worth 1.0 Box-Toppers point). Forty different players have earned at least 20 Box-Toppers points in a single season. The feat of 20 points in a season has been accomplished 74 times, including by the 13 players who have done it more than once. In 2006, Lance Berkman of the Astros had 20.8 Box-Toppers points (ranking second behind Santana’s 25.7), the highest single-season point total by a batter in Box-Toppers’ 23-season tracking history. In 2002, Barry Bonds of the Giants had 20.7 points (ranking fourth that season). In 1996, Albert Belle of the Indians had 20.4 points (ranking second behind John Smoltz of the Braves with 26.1).